Detox Day 1 went really well. Allan and I both felt significantly more energized yesterday afternoon after dragging a bit in the morning. I even had enough energy to wake up early this morning (5:30 AM!!!) and workout. It is so nice to have that taken care of already and be able to spend my afternoons checking things off of my To Do list. I am amazed at how much energy I have today. I really thought that cutting out sugar and caffeine would have more of an impact on my mood and energy levels, but I am doing really well. As you know, I love oats! I put them in everything… muffins, pancakes, meatballs, breakfast bakes, smoothies… One of my favorite ways to enjoy oats is for breakfast. Although I am a fan of rolled oats, my preferred oat of choice is steel cut. I adore the nutty, soft, chewy texture. What I do not enjoy is babysitting a pot for 15 minutes. Mornings in our house are jam-packed and I always manage to scorch some of the oats to the bottom of the pan. I know lots of people make oats in their slow cooker, but I always imaged that the resulting oatmeal would be more baked than chewy and would leave me with a mess of a pot to deal with in the morning. Enter the crock pot . A few weeks ago while browsing Pinterest, I spotted an amazing idea to solve my crock pot oats concerns. 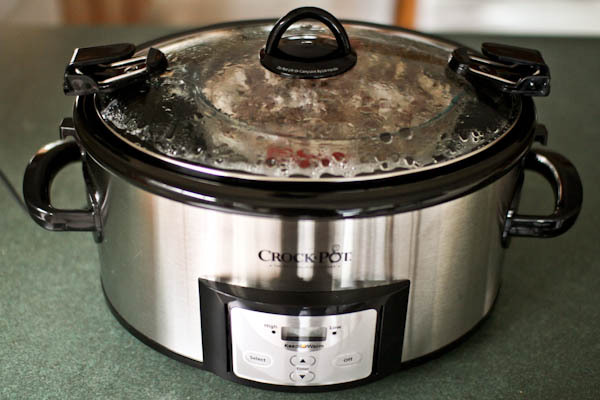 I immediately went to Target and bought a new programmable 6 qt crock pot and got to work. Yes, we do have a cheap slow cooker that we received for our wedding; however, it has a hot spot and is not programmable, which has banished it to the far reaches of our attic. This oatmeal turned out better than stovetop oats and I only had to stir it twice. 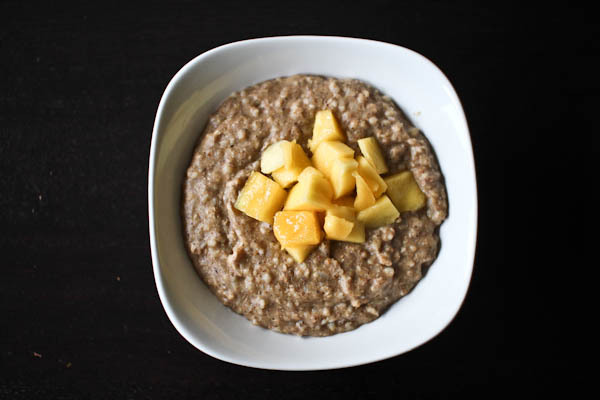 When we were ready for breakfast, I simply lifted the lid off the slow cooker, stirred the oats to recombine the ingredients and scooped oatmeal into bowls. Even better yet, I made enough oats for several days worth of breakfasts. I love waking up to a warm bowl of oats! 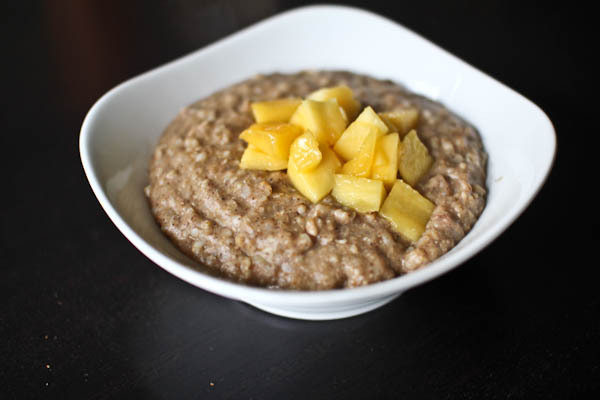 Steel cut oats are sweet and nutty with a dense chewy texture that your whole family will love. The addition of spices and banana add natural sweetness. 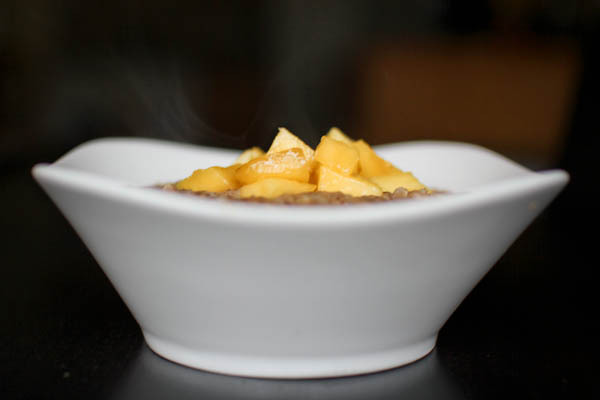 Make it a complete meal by topping your oatmeal with fresh fruit and a side of egg whites. The night before, stir together all ingredients in a medium sized glass measuring cup. Place measuring cup in the bowl of the slow cooker. Add several cups of water to the bowl of the slow cooker, until the water comes half way up the side of the measuring cup. Note: do not place the additional water into the glass measuring cup with the oats. 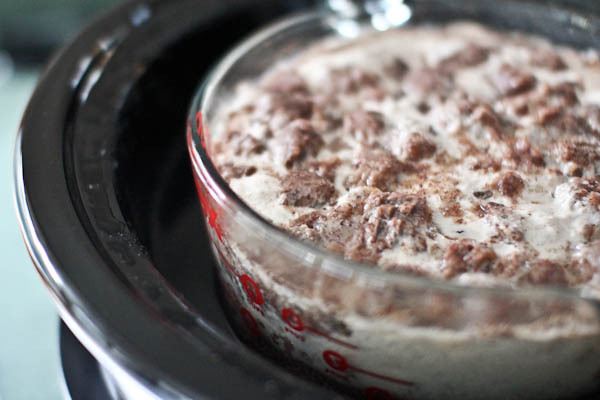 You are simply creating a bain-marie (aka water bath) for your oats. See photo below. Cover the slow cooker. Set to low heat for 7 hours. In the morning, remove the cover and gently stir the oats, as the banana and cinnamon will separate from the oats and float to the top. 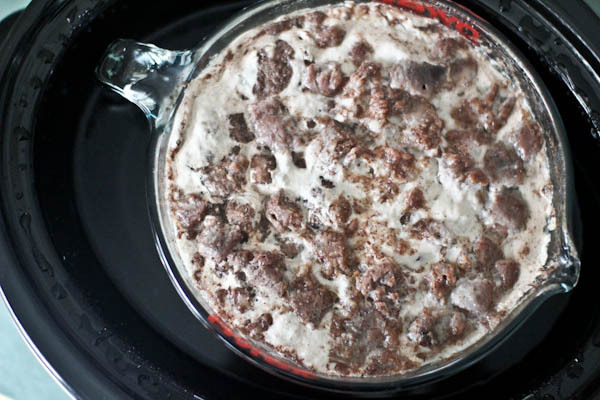 Feel free to double or triple this recipe and have oats for the whole family for a couple days. Keeps well in the fridge for 3 days. To reheat, place oats in a saucepan on the stovetop with a little additional water to thin, set to medium heat and in 5 minutes you will have warm oatmeal. This post is part of the Family Favorites series that focuses on our most adored meals that are both kid- and adult-friendly, have minimal weekday prep time and are flavorful and sustaining.